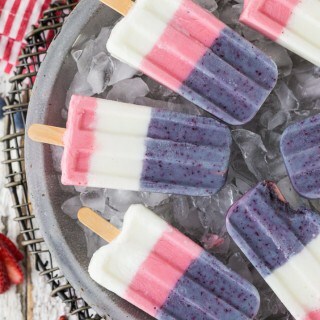 Red White and Blue Popsicles are the perfect cute, festive, sweet treat for the 4th of July! These fun and tasty treats are so cute and easy to make. These colorful Smoothie Pops are healthy too! I used Greek Yogurt, fresh fruit, and raw organic sugar to keep them fresh and light, while still being super yummy. Healthy Homemade popsicles are so much fun for summer! Blend the strawberries with 1/2 tablespoon Sugar and 1/4 cup water. Pulse until well combined. Add 1 cup greek yogurt and blend until fully smooth. Add 3 drops red food coloring if you would like the color to be a bit more vibrant; totally optional. Set aside. Keep refrigerated until use. Repeat steps with each type of fruit, using blue food coloring with the blueberries if you want the color to be a bit more blue, again, optional. Start by adding a layer of blueberry mixture to the bottom of each popsicle mold. Add your popsicle sticks and allow layer to freeze for about 2 hours. Follow with layer of either banana or strawberry, alternating if you wish. Allow this layer to freeze as well before adding your final layer. Allow pops to freeze fully before serving.